Most of those lookk familiar, Amy- prob becaus I've seen you wear them. 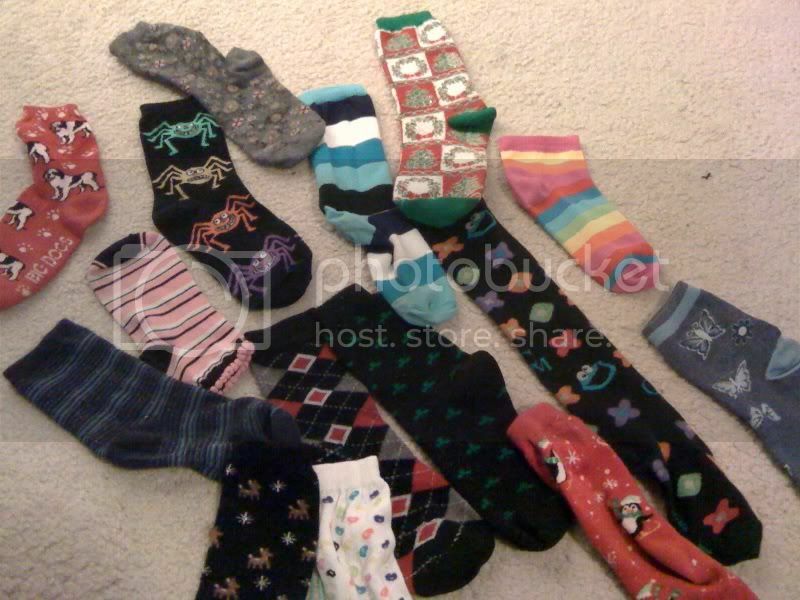 However,, a couple look like some I see in MY unmatched sock basket! Maybe you left them here??? oh man my pile would be just as plentiful though not nearly as colorful! FUN SOCKS!! I love love love fun socks!! I CRY when my fun socks get separated... now, I shed a little tear for you... forever and ever... oh,sorry. Got all caught up in the poetry and music of the moment. Just keep throwing them back in the wash and soon enough they find their mate - or they are just freakin incredibly clean before you toss them. My 15 year old daughter would find pairs to wear in that pile. If she wears matching socks we check to see if she is feeling ok. I think it can be traced back to wearing years of goofy softball socks. She just likes to mix it up a little! @Kimybeee -- Have you heard of Little Mismatched? Wish I'd thought of it. I bet mismatched socks aren't so frustrating when they are helping you rake in the dough. My 18 year old rarely wears socks of the same color, never mind an actual matching pair! thats why i have boring socks -- all one color, all one style so they always match!